Offering you a complete choice of products which include jyotish sagar astrology magazine february 2019, jyotish sagar astrology magazine december 2018, jyotish sagar astrology magazine, jyotish sagar astrology magazine april, 2019, jyotish sagar astrology magazine january 2019 and jyotish sagar astrology magazine november 2018. Jyotish Sagar’s February, 2019 issue has been published now. This is a special issue on “Obstacles in Bhagyoday & Vasant Panchami (10th February, 2019)”. 4. Health problems of working people and their simpletreatment.5. Astrological Measures of Planets. 6. Mind, Intelligence and Body.7. Valentine Day 14th February, 2019 : From Your Valentine.8. ‘The Kapil Sharma’s Show’ season 2 : What do his Stars say?9. Why does your destiny not rises? 10.Pt. Uday Shankar’s Dance World.11.The Shakata Yoga and Bhagyodaya. 12.When will your destiny be rise. 13.In successful, famous and Rich person fortunate?14.Aspects of planets in Stellar Astrology.15.Effects of Rahu in Eight House.16.Gupt Navratra 5th February to 14th February, 2019.17.Month Planner (February, 2019) : Hindu Vrat (Fasts) and Parva (Festivals). December, 2018 Issue of Jyotish Sagar has been published now. This is the special issue is on the Annual Forecast, Year 2019 (Varshik Rashiphal-2019). Annual Zodiac Interpretations and weekly forecasting for entire year are unique features of the issue. In addition, for each Zodiac Beneficial planets,Gemstones, Rudrakshas, Worshiping God-Goddess, etc. are also suggested as per planet position of whole year 2019. For Each Zodiac Discription : How will be 2019 for you? Your Personality, Beneficial for you, Relief Measures, Dates to be for Cautious , Annual and weekly Forecast 2019 (For your Health, Financial Condition, Family, Happiness, Carrier, Service, Business, Social aspects /field). 1. How to worship Lord Shiva on this Maha Shivaratri ?2. Maha Shivaratri : The Festival of Rudraksha wearing.3. 2018 : Fourth warmest year of Earth?4. Kenneth C. Griffin : Bought America’s most expensive house.5. Priyanka Gandhi : How Will be her political inning? (Horoscope Analysis of Priyanka Gandhi). 6. Astrological Analysis : Child adoption or be adopted .7. Festival of Colours Holi.8. Shiva – Parvati wedding festival.9. Rudraksha is helpful in bhagyodaya. 10. Gemstones are helpful in bhagyodaya.11. Who will live in other countries? 12. Disease and Debts : Reasons and Prevention. 13. Birth and occupation.14. Parapsychology: The Amazing Powers of the Human Mind.15. Date of Birth of Swami Dayanand Saraswati : A Survey of sources.16. Worship of Char Prahar muhurta at the night of mahashivaratri.17. Holika Dahan Shubh Muhurta on (20thMarch, 2019).18. Month Planner (March, 2019) : Hindu Vrat (Fasts) and Parva (Festivals). Jyotish Sagar’s April, 2019 issue has been published now. 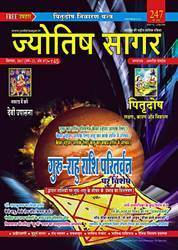 This is a special issue on “Baglamukhi Upasana, Basantiya Navratra & Hanuman Jayanti”. 1. Bagalamukhi worship and chanting mantras to resolve hurdles.2. Two Magical Mantras of Goddess Baglamukhi.3. Shri Bagalamukhi Shabar Mantra.4. This Temple is dedicated to Lord Hanuman Ji’s Son.5. Lord Hanuman was born here !6. Shri Baglamukhi is not a Tamsi Goddess.7. Shri Baglamala Mantra.8. Parapsychology : Forecasting of diseases from dreams.9. 52 Shakti peeth of Aadya Shakti. 10.Five Stambhan vidyas of Goddess Baglamukhi.11.Vankhandeshwar siddha is ancient place.12.Bagla- namemantra Sadhna for resolve of problems given by enemies and planets etc.13.Peetambara Upanished.14.“Hleem” or “Hlreem” : What is chanting?15.Sri Peetambara Peethadheeshwar Rashtraguru Swami Ji Maharaj.16.Shri Vallabhacharya Jayanti (April 30th, 2019).17.Basant Navratra and Ghata Sthapana Shubh Muhurta (April 06th, 2019).18.Month Planner (April, 2019) : Hindu Vrat (Fasts) and Parva (Festivals). Jyotish Sagar’s January, 2019 issue has been published now. 1. How will it be for the year 2019 India ?2. Analysis of Swearing in Horoscopes : New Governments, New Hopes ! 3. Marriage of Priyanka Chopra and Nick Jonas : Astrological Analysis..
4. The Life Rise and Fall in : An Astrological view. 5. Jupiter’s Transit and Punishment in Court Case. 6. Who is your favourable god in your horoscope ? How to Choose? 8. National Festival Uttrayan (Makar Sakranti). 9. Prayagraj (Allahabad) Ardh Kumbh Festival (4th January, 2019). 10. Makar Sankranti on 14th January, 2019. 11. Month Planner (January, 2019) : Hindu Vrat (Fasts) and Parva (Festivals). Five Days of Deepawali Festival: A Festival Planner. How to worship Mahalakshmi on this Deepawali 7th November, 2018? Arogya Festival : Dhantrayodashi 5th November, 2018. Auspicious and prosperous celebration of Dhantrayodashi 5th November, 2018. The Shopping Festival Dhantrayodashi 5th November, 2018. How to celebrate Naraka Chaturdashi/ Roop Chaturdashi on 6th November, 2018? Hanuman Jayanti on 6th November, 2018 : How to worship Lord Hanuman? Annakut & Govardhan Festival on 8th November, 2018. A symbol of Brother & Sister love : Bhaidooj on 9th November, 2018. Festival of Lighting and Prosperity : Deepawali. Perform Mahalakshmi Poojan on Business or Office Place on 7th November, 2018. A detailed Introduction of Shri Yantra. Decorate the house according to Vaastu. Vaastu Shastra : Impact and Solution of Junk. Parapsychology : Mystery of the Universe : A Review. Parapsychology : Gama wrestling was done with divine souls. Shubh Muhurta for India’s Major cities to Pooja of Goddess Mahalakshmi in Pradosha, Taurus or Vrishabha lagna and Midnight Leo Lagna or Simha Lagna ( Delhi, Mumbai, Kolkata, Chennai, Jammu, Shimla, Chandigarh, Jaipur, Gandhi Nagar, Lucknow, Bhopal, Dehradun, Raipur, Ranchi, Patna, Bhuvneshwar, Bangalore, Hyderabad etc). Month Planner (November, 2018) : Hindu Vrat (Fasts) and Parva (Festivals). How will Jupiter's Transit in Scorpio affects you? Jupiter's Transit in Scorpio: How will it be for Aries (Mesha)? Jupiter's Transit in Scorpio: How will it be for Taurus (Vrishabha)? Jupiter's Transit in Scorpio: How will it be for Gemini (Mithun)? Jupiter's Transit in Scorpio: How will it be for Cancer (Karka)? Jupiter's Transit in Scorpio: How will it be for Leo (Simha)? Jupiter's Transit in Scorpio: How will it be for Virgo (Kanya)? Jupiter's Transit in Scorpio: How will it be for Libra (Tula)? Jupiter's Transit in Scorpio: How will it be for Scorpio (Vruschika)? Jupiter's Transit in Scorpio: How will it be for Sagittarius (Dhanu)? Jupiter's Transit in Scorpio: How will it be for Capricorn (Makar)? Jupiter's Transit in Scorpio: How will it be for Aquarius (Kumbha)? Jupiter's Transit in Scorpio: How will it be for Pisces (Meena)? Predictive Astrology: Why Ravan Becomes Majestic. Numerology: Select Your Lucky Mobile Number. Sharadiya Navratra on 10th to 18th October, 2018. Ghata Sthapana Shubh Muhurta (10th October,2018) for India’s Major cities (Delhi, Mumbai, Kolkata, Chennai, Jammu, Shimla, Chandigarh, Jaipur, Gandhi Nagar, Lucknow, Bhopal, Dehradun, Raipur, Ranchi, Patna, Bhuvneshwar, Bangalore, Hyderabad etc.). Vijayadashami on 18th -19th October, 2018. Month Planner (October, 2018): Hindu Vrat (Fasts) and Parva (Festivals). Jyotish Sagar’s September, 2018 issue has been published now. This is a special issue on “Ganesha Chaturthi and Krishna Janmashtami”. Lord Ganesha sits in three forms in Chintaman Ganesh Temple ! Lord Ganesh’s Ucchi Pillayar Temple : Vibishana established the Temple of Lord Ganesh. Wimbledon 2018 Winner : Novak Djokovic. Shankha Yoga : Makes is famous in a particular area. Mental disorders and Marital Problems : An Astrological View. Antiquity of Lord Ganesha’s worship. Various types of Yoga (Part-2). Parapsychology : Life saving by a Dream. Burari Case : As per Vastu View. Horoscope Analysis of Imran Khan, The New Elected Prime Minister of Pakistan. Horoscope Analysis of Late Karunanidhi. Krishna Janmashtami (2nd - 3rd September, 2018). Ganesha Chaturthi (13th September, 2018). Lord Vrah Jayanti (12th September, 2018). Lord Vaman Jayanti (21st September, 2018). Bhuvaneshwari Jayanti (21st September, 2018). Pitripaksh (24th September to 8th October, 2018). Month Planner (September, 2018) : Hindu Vrat (Fasts) and Parva (Festivals). Jyotish Sagar’s August, 2018 issue has been published now. This is a special issue on “Shravan Month and Kaalsarpayoga ”. Goddess Sati’s head was dropped on the hills of Balochistan ! An Astrological View : Horoscope Analysis of Sanjay Dutt. Nadi Astrology : Which gives birth information also. Predictive Astrology : Yogas of indebtedness in the Horoscope. How does long Bit-Coin’s Charisma? Nadi Astrology : When does a woman become a Queen? The Practical signs of Kalsarpa Yoga. New explanation of Kalsarpa Yoga and Kalamrit Yoga. Kalsarp : The Controversial yoga. 12 types of Kalsarp Yoga and their results. Lord Hayagriva : Guardians of Vedas. Surgical Science in Ancient India. Spirituality : Form and Process of Meditation. Month Planner (August, 2018) : Hindu Vrat (Fasts) and Parva (Festivals). Jyotish Sagar's July, 2018 issue has been published now. 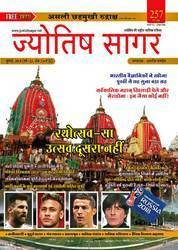 This is a special issue on "FIFA World Cup - 2018, Guru Purnima (27th July, 2018) and Jagannath Puri Rath Yatra (14th July, 2018) ". Indian Scientists discover six times larger planet than earth. Here every man does another Marriage ! Guru's disciple tradition is Thousands of years old. Watches rotate the opposite direction at here! FIFA World Cup 2018 Watch over these Horoscope Analysis of Lionel Messi, Cristiano Ronaldo and Neymar. All-time great Player Pele and Diego Maradona Horoscope Analysis. Gupta Navaratra (13th July to 21st July, 2018). Marriage Astrology What a Marital bond, Which made ten years Prisoner. Science in ancient times Physics in ancient India. Parapsychology The supernatural power of the astral body. Astrology in History Astrology in Mughal Coins. Lunar Eclipse (27th - 28th July, 2018). Shravan Month Remove the planetary obstacles with Gemstone & Rudraksha. Lokmanya Bal Gangadhar Tilak Jayanti (23rd July, 2018) Horoscope Analysis of B.G. Tilak. Month Planner (July, 2018) Hindu Vrat (Fasts) and Parva (Festivals). Jyotish Sagar’s June, 2018 issue has been published now. This is a special issue on “Batuk Bhairav Jayanti (20th June, 2018)”. Batuk Bhairav Jayanti: Batuk Bhairav brings outside from Critical or Crucial Time. Batuk Bhairav Fast falls on Sunday. Malafic Effects of a Planet could be Removed through Meal. Select Exercises as per your Zodiac Sings. Palmistry: In the Palm, One is Hero, Other is Zero. Medical Astrology: Learn about the effect of Saturn on the health issues. Importance of truth speech in religious texts. When Yamraj had to take human birth. Sant who is doing meditation since last 550 Years ! Ayurveda: Sugarcane Juice is the beneficial drink for Summer. Sant Kabirdas Jayanti (28th June, 2018). Month Planner (June, 2018): Hindu Vrat (Fasts) and Parva (Festivals). Jyotish Sagar’s May, 2018 issue has been published now. This is a special issue on “Shani Jayanti (15th May, 2018)”. Results of Malefic Saturn are removed only by Lord Shani Dev’s parikarma. Shiva Temple is like the Parliament house of Delhi. Women freely offer sesame oil in Lord Shani Temple. Sound of the seven vowels of music from the Saraswati temple where the columns come out . Haridwar is the gateway of Holy Shrines. Scientific discovery on after death. How much lucky is your wife? Know through the Palmistry. Worship of Goddess Ganga gives results equelent to Ashwamedha Yajna. Tagore Jayanti (7th May, 2018). Month Planner (May, 2018) : Hindu Vrat (Fasts) and Parva (Festivals). Jyotish Sagar’s April, 2018 issue has been published now. This is a special issue on “Baglamukhi Jayanti (23th April, 2018) and Other’s Jayanti”. Bagalamukhi worship and chanting mantras to resolve enemy barriers. Heart Diseases : Astrology and Ayurveda. Gemology and Astrology in Ancient India. Astrology in Sant Suradasa’s Literature . World-class India is the creator of World Science. Parashurama, the sixth incarnation of Lord Vishnu. Narsimha Jayanti (28th April, 2018). Maharishi Parashurama Jayanti (18th April, 2018). Adi Shankaracharya Jayanti (20th April, 2018). Month Planner (April, 2018) : Hindu Vrat (Fasts) and Parva (Festivals). Jyotish Sagar’s March, 2018 issue has been published now. This is a special issue on “Holi, Basantiya Navratri & Hanuman Jayanti". Do you know that Lord Hanuman also has Five Brothers? Astrological Analysis of Lord Hanuman. Astrological Reasons of Kidney Stone. Medical Astrology : Astrology & Leucoderma. Do Durgasaptashati on this Navratri. Know how Gems contains the infinite power to remove the disease. Holika Dahan Shubh Muhurta on (1st March, 2018). Basant Navratra and Ghata Sthapana Shubh Muhurta (March 18th, 2018). Month Planner (March, 2018) : Hindu Vrat (Fasts) and Parva (Festivals). Jyotish Sagar’s February, 2018 issue has been published now. This is a special issue on “Maha Shivaratri (13th – 14th February, 2018)”. How to worship Lord Shiva on this Maha Shivaratri ? Lord Shiva worship in the Astrology. Maha Shivaratri : The Festival of Rudraksha wearing. Impacts of the Mantras on health. Litigation and Court Cases and K.P. Astrology. Auspicious effects of Vastu on human life. Temple where Shiva is worshiped in the form of women. Know your personality by the Blood Group. Month Planner (February, 2018) : Hindu Vrat (Fasts) and Parva (Festivals). How to worship Goddess Saraswati on this Vasant Panchami ? Netaji Subhash Chandra Bose : And His Freedom Fight…!! Education Study By K.P. Astrology. Medical Astrology : Diabetes and Astrology. Rahul Gandhi : Is time being changed? Historical Sun Temple where Lord Sun worship is Prohibited. The Temple of Lord Brahma is also in Bangkok. Lunar Eclipse will be observed on 31st January, 2018. Makar Sankranti on 14th January, 2018. Swami Vivekananda Jayanti on 12th January, 2018. Lala Lajpat Rai Jayanti on 28th January, 2018. Month Planner (January, 2018) : Hindu Vrat (Fasts) and Parva (Festivals). December, 2017 Issue of Jyotish Sagar has been published now. 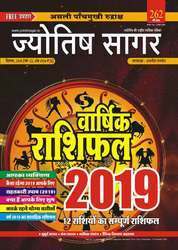 This issue is based on the Annual Forecast, Year 2018 (Varshik Rashiphal-2018) together Annual Zodiac Interpretations where the entire year and weekly forecasting. In addition, for each Zodiac Beneficial planet, Wearing Gemstone, Rudraksha, Worshiping God-Goddess, etc. are also described. Aries: How will be 2018 for you? Your Personality, Beneficial for you, Relief Measures, Dates to be Curios , Annual and weekly Forecast 2018 (Health, Financial Condition, Family, Happiness, Carrier, Service, Business, Social Forecasting). Taurus: How will be 2018 for you? Your Personality, Beneficial for you, Relief Measures, Dates to be Curios , Annual and weekly Forecast 2018 (Health, Financial Condition, Family, Happiness, Carrier, Service, Business, Social Forecasting). Gemini: How will be 2018 for you? Your Personality, Beneficial for you, Relief Measures, Dates to be Curios , Annual and weekly Forecast 2018 (Health, Financial Condition, Family, Happiness, Carrier, Service, Business, Social Forecasting). Cancer: How will be 2018 for you? Your Personality, Beneficial for you, Relief Measures, Dates to be Curios , Annual and weekly Forecast 2018 (Health, Financial Condition, Family, Happiness, Carrier, Service, Business, Social Forecasting). Leo: How will be 2018 for you? Your Personality, Beneficial for you, Relief Measures, Dates to be Curios , Annual and weekly Forecast 2018 (Health, Financial Condition, Family, Happiness, Carrier, Service, Business, Social Forecasting). Virgo: How will be 2018 for you? Your Personality, Beneficial for you, Relief Measures, Dates to be Curios , Annual and weekly Forecast 2018 (Health, Financial Condition, Family, Happiness, Carrier, Service, Business, Social Forecasting). Libra: How will be 2018 for you? Your Personality, Beneficial for you, Relief Measures, Dates to be Curios , Annual and weekly Forecast 2018 (Health, Financial Condition, Family, Happiness, Carrier, Service, Business, Social Forecasting). Scorpio: How will be 2018 for you? Your Personality, Beneficial for you, Relief Measures, Dates to be Curios , Annual and weekly Forecast 2018 (Health, Financial Condition, Family, Happiness, Carrier, Service, Business, Social Forecasting). Sagittarius: How will be 2018 for you? Your Personality, Beneficial for you, Relief Measures, Dates to be Curios , Annual and weekly Forecast 2018 (Health, Financial Condition, Family, Happiness, Carrier, Service, Business, Social Forecasting). Capricorn: How will be 2018 for you? Your Personality, Beneficial for you, Relief Measures, Dates to be Curios , Annual and weekly Forecast 2018 (Health, Financial Condition, Family, Happiness, Carrier, Service, Business, Social Forecasting). Aquarius: How will be 2018 for you? Your Personality, Beneficial for you, Relief Measures, Dates to be Curios , Annual and weekly Forecast 2018 (Health, Financial Condition, Family, Happiness, Carrier, Service, Business, Social Forecasting). Pisces: How will be 2018 for you? Your Personality, Beneficial for you, Relief Measures, Dates to be Curios , Annual and weekly Forecast 2018 (Health, Financial Condition, Family, Happiness, Carrier, Service, Business, Social Forecasting). Jyotish Sagar’s November, 2017 issue has been published now. This is a special issue on “Tantra - Mantra - Yantra”. How to do Mantra Sadhana? How to do Shabar Mantra Sadhana? How to do Yantra Sadhana? Shatchandi Anushthan : An Introduction. Various uses of Gayatri Mantra. It is impossible to change Destiny. Mahadasha’s tells the secret of Birth & Death. The Mysterious person who changed my life. Why is the South- Facing plot is inauspicious? Guru Nanak Jayanti 4th November, 2017. Gita Jayanti 30th November, 2017. Month Planner (November, 2017) : Hindu Vrat (Fasts) and Parva (Festivals). Jyotish Sagar’s September, 2017 issue has been published now. This is a special issue on “Jupiter’s Transit in Libra”. How will Jupiter's Transit in Libra affect you? Jupiter's Transit in Libra, effects on various Signs. Jupiter's Transit in Libra: How will it be for Aries? Jupiter's Transit in Libra: How will it be for Taurus? Jupiter's Transit in Libra: How will it be for Gemini? Jupiter's Transit in Libra: How will it be for Cancer? Jupiter's Transit in Libra: How will it be for Leo? Jupiter's Transit in Libra: How will it be for Virgo? Jupiter's Transit in Libra: How will it be Leo for Libra? Jupiter's Transit in Libra: How will it be for Scorpio? Jupiter's Transit in Libra: How will it be for Sagittarius? Jupiter's Transit in Libra: How will it be for Capricorn? Jupiter's Transit in Libra: How will it be for Aquarius? Jupiter's Transit in Libra: How will it be for Pisces? Sharadiya Navratri on 21st to 29th September, 2017. Vijayadashami on 30th September, 2017. Pitridosha and Pitripaksh 05th to 20th September, 2017. Month Planner (September, 2017): Hindu Vrat (Fasts) and Parva (Festivals). Why is Shani Shaman necessary? How will be Saturn in Scorpio for you? Shani Shaman through Yantras, Donation etc. .
Transiting Saturn in Scorpio : Effects & Remedy. Saturn’s name is bigger than Saturn. Saturn and remedies of disease factor. Simple and effective solution for reducing Saturn defects. Special results of Saturn according to its avasthas. Saturn’s malefic results and remedies. Sant Kabirdas Jayanti (9th June, 2017). Month Planner (June, 2017) for Hindu Vrat (Fasts) and Parva (Festivals). Jyotish Sagar’s July, 2017 issue has been published now. This is a special issue on “Rudraksha and Kaalsarpayoga”. Kaalsarpa Shanti from Gemstones and Rudrakshas. When is Kaalsarpayoga more Effective? Kaalsarpayoga in India’s Independence Horoscope. Which Kaalsarpayoga has positive impact and which has negative impact. Shiva Worship in the month of Shravan. Rudraksha for Removing Malefic Effects and Increasing Benefice Results of Planets. Scientific Reasons of the far vision of the Mahabharta.. Different Rituals for worship of Naga (Serpant). Nakshatra Astrology: Planets and their Importance. Guru Purnima (9th July, 2017): The Festival of Guru worship. Month Planner (July, 2017) a Hindu Vrat (Fasts) and Parva (Festivals). May, 2017 of Jyotish Sagar has been published now. This is a special issue on “Astrology and Gemstone”. Gemstones wearing principles: How are the gemstone used in astrology? Selection of right gemstone with right metal? Suitable weight of a gemstone for wearing as per astrology. When and How to wear gemstone? Friendship and enemies among gemstone. Horoscopic Analysis: Uttar Pradesh’s Chief Minister Yogi Adityanath Government will be successful. Wearing of gemstone according to Lal Kitaab. Month Planner (May, 2017) for Hindu Vrat (Fasts) and Parva (Festivals).